When you first visit The Palaces Casino, you get an instant sense that this is a site that is focused on, and to an extent dedicated to customer satisfaction, it feels like customers are put first here. That’s a lovely feeling to get when you first start playing at an online casino site, but we have all made this assumption and been wrong before, so it will take more than just a sense of being well looked after to tempt in a decent number of players. With the online casino market being arguably the busiest and most competitive in the world, what does The Palaces Casino have to offer players to ensure that it doesn’t, like so many sites before it have, simply get lost in the shuffle? The design of The Palaces Casino is interesting, whether that is a good thing I am not entirely sure, but it is definitely interesting. There is a sense that this site has not completely decided what it wants to be, the logo is what you would expect from a casino named The Palaces, a fairly decadent image, but the banners across the top of the homepage are colourful, with bold and bright images scrolling across the page. Scan down further, and you get thumbnails of many of the most popular games in the site, placed over a very simple and subtle black and grey background. Essentially, The Palaces Casino looks like a cut and shut sites, like three different online casinos have been stuck together without any attempt to make them fit. That being said, there is something fun about the mix of styles going on here, it certainly gives a sense of the unique, which is something that is rare to say the least in the casino market, and it doesn’t look unattractive, it’s a little odd, but some of the best things in the world are a little odd. 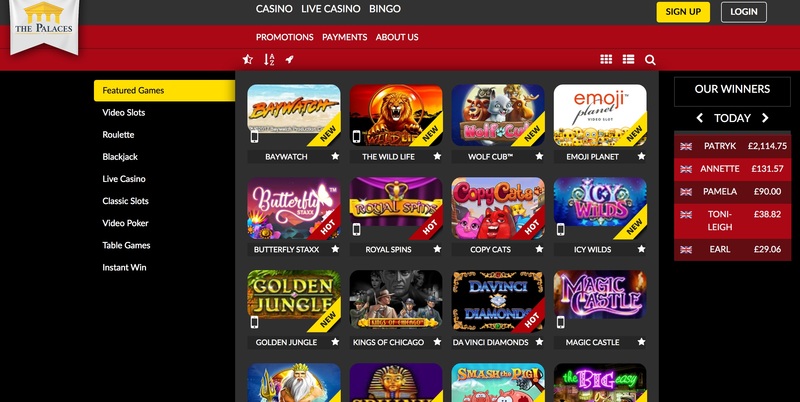 In order to succeed on the modern market as a casino site, you have to offer a range of titles from an array of software providers, unfortunately, The Palaces Casino doesn’t really have that. There is an interesting mix, in that popular software developers like IGT and NetEnt are available alongside some providers who are far less common amongst rival sites, names like Comtrade Gaming and Parlay Games. If you are a slots fan, and you enjoy new releases, you’ll be excited by what’s on offer here, with Fairytale Legends: Red Riding Hood, Goldify, 1421 Voyages of Zheng He, Motorhead, Cleopatra Plus, and many more. Don’t worry, if you’re more comfortable with old reliable, the likes of Starburst, Cleopatra, Da Vinci Diamonds, and Gonzo’s Quest are here alongside many other favourites. If you’re all about the table and card games, you’ll find blackjack, roulette, and video poker here in abundance, with many of the available games also playable at the impressive live casino. This is a site that could benefit from offering games from a few more software providers, because considering how impressive the site is with its shortcomings, it will be nothing short of spectacular with a little more choice available. A good site regardless, but with the ability to get much better with a few small changes.